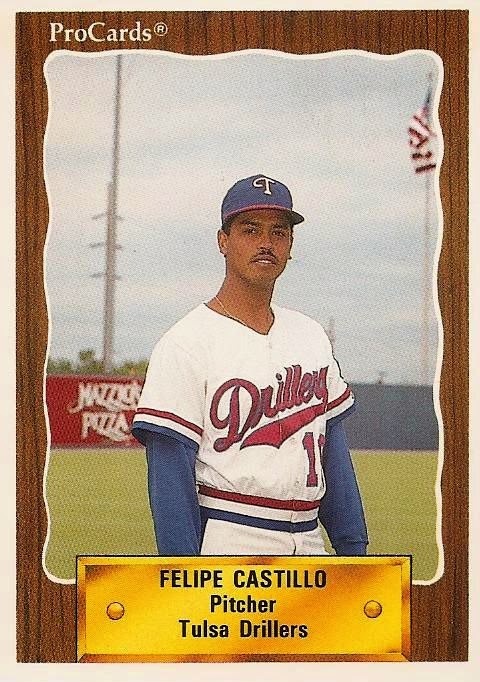 Texas Rangers Cards: Minor League Monday - Felipe Castillo, 1990 ProCards Tulsa Drillers. Minor League Monday - Felipe Castillo, 1990 ProCards Tulsa Drillers. Felipe Castillo, shown here on ProCards Tulsa Drillers card 1150, was signed by the Rangers as a free agent at age 19 in 1986. He started his pro career the same year with the Gulf Coast Rangers in Rookie ball. The four years between the start of Felipe's career and the issuing if this card were not easy ones for Castillo. He got his ERA below 4.25 only once: 2.78 in a 23 game stint with the Low A Gastonia Rangers in 1988. Somehow he kept climbing and ended up with Double A Tulsa for the 1990 season. Up to 1990, Castillo had been primarily a starter. That obviously wasn't working out well so the Rangers transitioned him to a relief role in 1990. He made 20 appearances out of the bullpen for the Drillers and tossed 46 innings. Felipe posted a career low 2.35 ERA while striking out 39. His 1.457 WHIP was a reason for concern but the improvement with the move to the bullpen had been dramatic. That was good for Castillo because he needed a dramatic improvement to keep his Major League dreams alive. The improvement was enough to earn Felipe a promotion to Triple A Oklahoma City for the remainder of the 1990 season. He came out of the bullpen 19 times and made one spot start for the 89'ers. Over 28.2 innings he compiled a 3.45 ERA and an 1.744 WHIP. Apparently that was enough for Texas, Castillo would not be back in 1991. Following the 1990 season is where Castillo's career takes an unusual turn and the lack of minor league information becomes frustrating. It appears he was out of organized baseball for four years. I can't even find any record of him playing in Japan. In 1995 Felipe re-surfaces at age 28 with the Tulsa Drillers, still a Rangers farm team. This is clearly a comeback attempt, not a spot appearance. He pitched 33 innings over 14 relief appearances and posted a 3.82 ERA and 1.606 WHIP. Not too shabby for a guy missing for four seasons and suddenly jumping back into Double A ball. That's it though. He's gone again after 1995. Castillo's back again in 2001 though. Still a reliever at age 34, he appears in ten games, evenly split between the independent Fort Worth Cats and the Triple A Mexican League Cordoba Cafeteros. Felipe got hammered over 4.1 innings with the Cats to a tune of a 6.23 ERA and a 2.077 WHIP. He did a little better with the Cafeteros as he posted a 3.18 ERA and an 1.941 WHIP. That was it. He finally hung up the spikes for good after 2001.